« Dow Jones up 331 points on speculation of a Fed rate cut. This is a bad comic, badly written and constructed. The art is sub standard. But it’s the story that is the real let down. Just when I thought Marvel: (Chart) had lifted it’s game in some of it’s publications; the company seems preoccupied with creating ‘event’ comics. Like the Civil War run, which could have caused more of a ruckus then it did, to the World War Hulk which was actually quite good. But Messiah Complex fails in every way, what could be a interesting and creative story turns out to be quite flat, nonsensical and pointless. Not to mention Marvels marketing department idea to create a one shot comic (Messiah Complex #1) which forces the reader to split the story up by reading a dozen or so other comics where the story continues. Bad idea. In other words you are then ‘obliged’ to look into other publications (if you want to find out what happens next), the hope is you might like one (of many) hence you start collecting that publication. From the bio page for Messiah Complex #1, “The story that begins here continues through all the X-Men books. Don’t miss it!” . All at the comprise of a decent story. The story? Well mutants (remember the movies?) 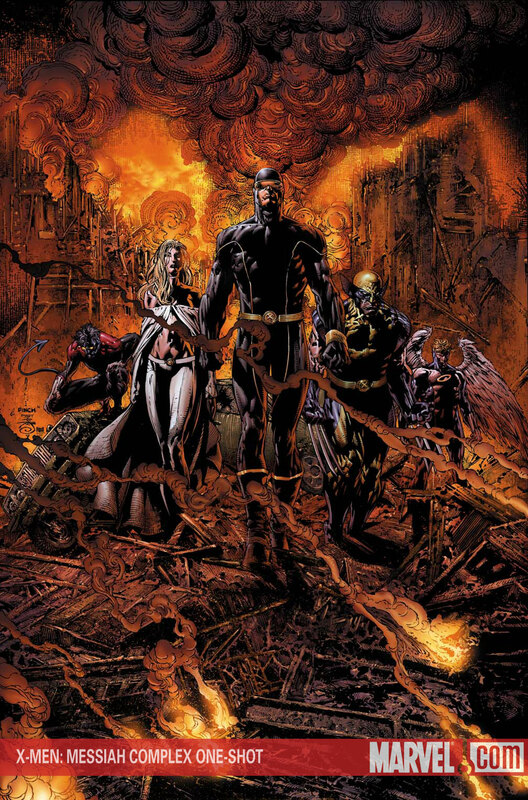 are dying off, a gene that makes one a mutant has been turned off, not to mention religious crazies called the Purifiers are taking out as many mutants as they can, in steps The X-men and another splinter group called the Marauders (who are mutants, but bad ones) – all the groups are looking for the one child that has been born with the mutant gene, despite the odds. Solid base for a story, but made a mess of it by the writer Ed Brubaker. Probably not so much his fault, just the broken up contiguity of the story, by splitting the story up into different comics could be the reason. This entry was posted on November 29, 2007 at 10:49 pm	and is filed under Books, Comic Reviews. You can follow any responses to this entry through the RSS 2.0 feed. You can leave a response, or trackback from your own site.